God's People Are Pilgrims in This World! It is once again time to celebrate that we are merely pilgrims and sojourners In this temporary, physical life. Here it is, time for another Feast of Tabernacles, and the Church of God is on the move again! 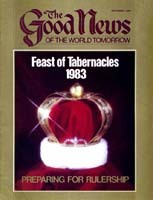 Brethren packing and hauling luggage, crisscrossing cities, countries, even continents, headed toward one of the more than 80 locations worldwide where the 1983 Feast of Tabernacles will be joyfully observed. God instructed that this Feast or Festival be observed in the seventh month of God's sacred calendar (Lev. 23:34-36, 39-43), which falls sometime in September or October of the Roman calendar, depending on the year. Did you ever wonder why travel and lodging in hotels, motels and other places of temporary habitation is associated with the Feast of Tabernacles? The word tabernacles means "temporary dwellings or abodes." This, then, is the Feast of Temporary Dwellings. When God ordained this Feast in ancient Israel, He instructed the Israelites to build booths or lean-tos to dwell in for the duration of the Festival (Lev. 23:40-43). The modern counterpart of these booths would be hotels, motels and other places of temporary residence. True, some brethren today live right where the Feast is to be observed. They may have no choice but to remain in their own homes. Still, for the duration of the Feast, they are involved in a daily routine of services, meals and activities that is different from what they do the rest of the year. For the majority in God's Church, however, travel and living outside their homes continues to be an integral part of the Feast observance. Why this change of routine? Why, for this brief period of the year, do God's people partake of a style and quality of life radically different from the norm? Why, during the Feast plus travel time, does the Church as a whole reside in temporary dwellings — hotels, motels, cabins, tents, campers? The answer lies in the meaning of the Feast. While in distress, the author of Psalm 42 remembered former, happier days. "I used to go with the multitude," he recalled. "I went with them to the house of God, with the voice of joy and praise [God's Holy Days are happy occasions! ], with a multitude that kept a pilgrim feast" (verse 4). A "pilgrim feast"? What did he mean by that? Pilgrims are travelers, wayfarers, sojourners. As long as they are pilgrims, they do not have a permanent residence. They are on the move. As the psalmist wrote in verse 2, he had a destination: He yearned to "come and appear before God." That's what true Christians do at God's Feasts. We appear before God at one of the locations He, through His chosen ministry, has designated and where He has placed His name (Deut. 14:23- 24). What a picture! Pilgrims wending their way to appear before God — to be with God. When you stop to think about it, that's what this life is all about for God's people. For the Christian, life is a journey with a destination. Just as the children of Israel wandered through the wilderness, living in temporary dwellings, before reaching the promised land, we are making our way to the eternal inheritance that has been promised to us. We are only heirs of salvation; we have not yet inherited it. We live in temporary dwellings in this life. Our homes are temporary. So are our physical bodies. The Feast of Tabernacles, or Feast of Temporary Abodes, calls attention to the fact that our physical existence is temporary, that we are pilgrims on our way to an awesome destination. The apostle Peter referred to scattered Christians of his day as "pilgrims of the Dispersion" (I Pet. 1:1). He stressed to the brethren that they were "sojourners and pilgrims" (I Pet. 2:11) and exhorted them to "conduct yourselves throughout the time of your sojourning here in fear" (I Pet. 1:17). A pilgrim does not "put down roots" in some location of his choosing. The moment he does so, he ceases to be a pilgrim. In Hebrews 11, various faithful servants of God are set forth as examples for Christians to follow. Abraham, for instance, "sojourned in the land of promise as in a foreign country" (verse 9). He merely sojourned there. Wealth and possessions he had. But he did not set his heart on them. He was not all wrapped up in ever trying to acquire additional material possessions and physical riches here and now. He knew this life is temporary. He looked to the future. He "waited for the city which has foundations [it will not be built on sand, as are all the fleeting works of mankind], whose builder and maker is God" (verse 10). The city referred to is, of course, Jerusalem as it will be when it is the headquarters and dwelling place of Almighty God. Abraham was not the only one whose heart was set on an eternal inheritance rather than a temporary, physical inheritance in this life. Others are named in this same chapter. "These all died in faith, not having received the promises, but having seen them afar off were assured of them, embraced them, and confessed that they were strangers and pilgrims on the earth. For those who say such things declare plainly that they seek a homeland" (verses 13-14). How about you? Do you belong to this world? Do material pursuits take up the choicest part of your time? Is your attention mostly centered on earthly things? Do your highest goals and aspirations revolve around the attainment of wealth, physical security and comfort? Or are you as a stranger and sojourner in this sin-weary world, just passing through, on your way to your homeland? Traveling to the Feast to appear before God, living in temporary dwellings at the Festival location and following a different routine during the Feast portrays that this life is so fleeting. Christians are looking ahead to something permanent. They are waiting for a city whose builder and maker is God. They have their sights set on the city prepared by God for them — holy Jerusalem. Listen to this description: "Great is the Lord, and greatly to be praised in the city of our God, in His holy mountain. Beautiful in elevation, the joy of the whole earth, is Mount Zion on the sides of the north, the city of the great King. God is in her palaces; He is known as her refuge" (Ps. 48:1-3). The age depicted in these verses is the wonderful world tomorrow, when Jesus Christ will be ruling on this earth. Then the whole world will finally realize the truth: This temporary life is just the preliminary, first step in the awesome human destiny. Man was created to ultimately — if he surrenders to God's government in this life — be born into the immortal Family of God. Living in temporary dwellings at the Feast of Tabernacles celebrates that this great truth will be universally understood during Christ's millennial rule. In ancient times those who kept the Feast spoke of having to "go up" to Jerusalem (John 7:8). So in the world tomorrow people will "go up" to Jerusalem to learn God's ways. If you are a member of God's Church you have been thinking for weeks, if not for months, about the joy of traveling to one of the Feast sites to appear before God. It is probably the highlight of your year. It has been on your mind. You have been contemplating it, talking about it, making plans. It's exciting. It's called "Feast fever." But are you much more excited and enthralled with a greater pilgrimage — your pilgrimage in this life to appear before God in the Jerusalem He shall build? How much do you plan for that event, think about it, yearn for it, long for it? "My soul longs, yes, even faints for the courts of the Lord; my heart and my flesh cry out for the living God," declares Psalm 84:2. As the sparrow or swallow, after considerable effort, finally finds a place to build a nest and lodge, so we, if we persevere, will finally reach God's house (verse 3). "Blessed are those who dwell in Your house," the psalm continues (verse 4). We will no longer dwell in temporary tabernacles of flesh — these physical tents (II Pet. 1:14). We will exchange them for permanent dwellings (II Cor. 5:1-4). We give God our ashes; He gives us beauty in return (Isa. 61:3). How is that for a trade? We surrender these mortal, corruptible bodies; we receive immortal, incorruptible bodies at Jesus' return (I Cor. 15:52-54). But we've got to make it to that point first! Back to Psalm 84, where verse 5 tells us how to be assured of getting to that great destination: "Blessed is the man whose strength is in You [we can't do it on our own strength! ], whose heart is set on pilgrimage." Notice that! Our hearts must be set on pilgrimage. They must not be set on this world. Our hearts must be set on pilgrimage — passing through this world, being sojourners with no permanent inheritance here. The values, the ideals, the customs, the styles, the philosophy and religion, the entertainment and glamour of this world must not dominate our lives. We should, of course, use whatever lawful physical possessions or opportunities we have for God's glory, but without setting our hearts on any of them. We must be ever ready to move on. We must be willing to cast aside anything that encumbers us or gets in the way of fulfilling God's will in our lives (Heb. 12:1). Successful pilgrims must be overcomers, as verses 6 and 7 of Psalm 84 indicate: "As they pass through the Valley of Baca [an arid valley on the way to Jerusalem], they make it a spring; the rain also covers it with pools. [We overcome circumstances — not vice versa.] They go from strength to strength [not from strength to weakness — from strength to strength. This is growth and victory! ]; everyone of them appears before God in Zion." That is the goal offered to you. That is what can be at the end of this physical existence for you. Think about that while you are living temporarily in different circumstances at the Feast of Temporary Dwellings. Life is a pilgrimage. Use what precious time is left to learn all you can about God's laws. Let them be written in your heart and mind. Study them. Meditate on them. Sing of them as David did. "Your statutes have been my songs," he declared, "in the house of my pilgrimage" (Ps. 119:54). At the Feast you are picturing that this life is temporary and that the existence that really counts is ahead in God's Family. Come to the Feast and celebrate your pilgrimage with great rejoicing!